The dragons at Kew Gardens have been reborn – Cube Breaker var scss_share_image="http://www.cubebreaker.com/wp-content/uploads/2018/08/4918.jpg"
The Great Pagoda, designed by Sir William Chambers in 1762, was the first significant Chinese-influenced structure in Europe. It was made as a gift to Princess Augusta the founder of Kew’s botanical gardens. The octagonal tower which stood ten storeys high was so unusual at the time it was built that people did not believe it will stand the test of time, only that it offered the best bird’s eye view of London. But it did stand the test of time. Two hundred fifty six years this year, to be exact. What didn’t stand history’s wear and tear, though, were the eighty dragons perched on its roofs, guarding the pagoda silently as their gold-gilded wood slowly rotted away. Thanks to the restoration project, however, the dragons have been reborn. Clad in their brilliant colors, they have reclaimed their perches as guardians of The Great Pagoda and a secret—that 72 of their dragon brothers are 3D printed, and that only eight of them (those perched at the lowest roof) were hand carved from cedar wood. Apparently, eighty hand-carved wooden dragons would be too heavy for the existing structure, and doing so would have required conservators to reinforce the existing structure with steel rods. While some people might find these new dragons looking quite kitsch, conservators assure us that the design was very true to its history. This is really how chinoiserie dragons looked like back in the 18th century, and how Chambers would have wanted them to look like. 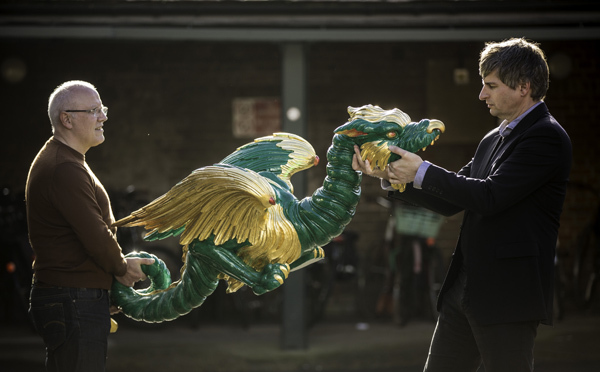 With the installation of these dragons, the £5m restoration project which took two years is now complete and The Great Pagoda will be open to the public again. Visitors can now book tickets starting July 13.